Two interlocking bronze rings symbolize the strength of love. 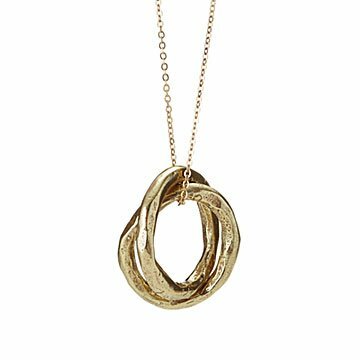 The bonds between a mother and child, between sisters, between best friends, or devoted partners—all have an ineffable strength symbolized elegantly in this necklace's two interlocking bronze rings. Tulianna and Alejandra Garces' hand-cast links are organically textured to hint at the beautiful imperfections inherent to any relationship, yet their essence embodies inseparable strength. Production of this piece benefits the International Rescue Committee, one of our Better to Give nonprofit partners that respond to humanitarian crises around the world. 18-inch, 24-karat gold chain. Handmade in Colombia. Use any jewelry cloth designed for cleaning bronze. Do not submerge in water. Loved it so much! My sister adored it when she got it! Absolutely beautiful, quality necklace with weight to it! This necklace is absolutely beautiful. I was surprised by the weight and high quality. The recycled bronze looks gorgeous for any occasion and has its own unique and elegant style. I've been wearing the necklace everyday since it arrived. Definitely worth the price and with an amazing impact in the world! So happy I purchased it. I want to thank the makers for their beautiful work, as I am also Colombian and appreciate this piece. My only comment is to please post another photo with the necklace on someone's neck. It is much larger, and heavier than I thought from the photos, and with this substantial a piece I would recommend a longer chain. But I haven't taken it off. Great to do business with soulful AND professional retailers. The workmanship is solid and the message is beautiful.